In honor of the 78th anniversary of the repeal of Prohibition in the U.S., December 5th, 1933. I love fictive maps, and propaganda maps, and this sits in the sweet-spot of Venn diagram of those two families. I don't know much about the mapmaker a Mr./s. G. E. Bula, but the timing and the subject matter would put him/her within the era where the U.S. temperance movement really started to gain some steam. Starting in the far left in "Decisionville" one may take the one single (literally) "straight and narrow path" and end up in the "Celestial City" (does that indicate that this map is Mormon, or have other groups used that phrase?) [not very likely... see comment section. -t59K]. I sure hope that if you take that path, you can get an express train, because most of the stops are either demonstrably lame, or have strange names that I'm afraid of finding out the meanings behind. 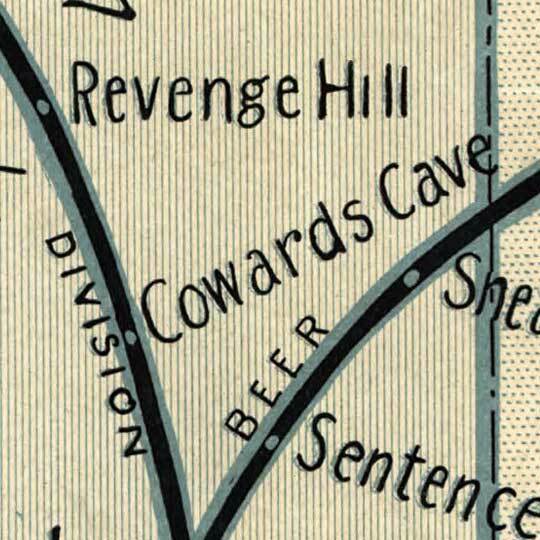 Now... not saying I want to live there, but I'm booking a ticket to "Prizefight City" on the shores of "Rumjug Lake". Maybe I'll just kick around there for a while... Take in some sights. Celestial City is probably a reference to the Pilgrim’s Progress, an allegorical novel that was once very widely read. I doubt that it’s Mormon related since there’s a Morman Swamp on the Way that Seemeth Right in the State of Vanity. Good catch, Drew. Thanks for pointing that out. But strange, though. 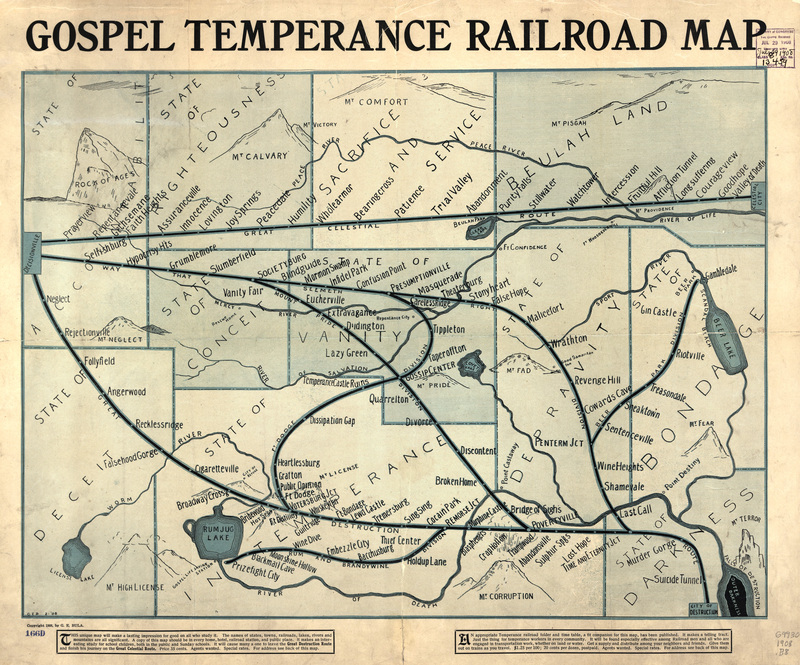 Why would they put Mormons — notorious non-drinkers — on a map of alcohol-related vice? I don’t know much about Mormonism, though; but I’d like to learn. Did they at some point have a more lax position on alcohol? Mormons have always been opposed to the consumption of alcohol, since Joseph Smith founded the religion; it was forbidden in the original Word of Wisdom (1833) http://en.wikipedia.org/wiki/Word_of_Wisdom. Many thanks for the insight. Updating post now. This is just untrue. The Word of Wisdom was not adopted as LDS church policy until it was voted on in general conference around the turn of the 20th century. This is why fundamentalist offshoots drink. Among other things, Joseph Smith drank from a smuggled flask to steel his nerves just before he was killed in Carthage Jail. (See Rough Stone Rolling.) Early church leaders drank after that. Brigham Young owned a Valley Tan distillery in Utah, setting the precedent for the territory to exercise monopoly in selling liquor to its residents. Observation of the Word of Wisdom was not tied to worthiness to attend the temple until well after that. Finally, Utah was the final state to ratify the 21st amendment to repeal prohibiion, by a voting majority of almost 3/4, despite the open opposition of then prohpet Heber J. Grant. The version you’re passing on is the one that is given to the children in Primary. People who read know the story is much more complex.